The title sounds a little bit New Age, but hang with me on this one. There's nothing extra-biblical in what I'm going to share with you today (and you know I take that very seriously). It isn't a secret that I love and use essential oils every day and that I count them as one of my top weapons for maintaining and supporting the health of my family. We use them as our first line of defense for most everything, including immune support, sleep support, muscle and joint support, and to affect mood, stress, and digestion...just to name a few. Until a few years ago, I would've said using them as a part of my prayer life sounded a bit hokie to me. I don't support new age moralism or secular humanist ways of elevating the self over God, and I'm not trying to teach you to use scents to ascend to a higher plane or indicate that you can get closer to God because of them. God wired our brains to recognize and respond to smell. How many times have you walked past a rose bush, or a honeysuckle tree and felt your spirits lift simply because they smelled so delightful? Has a scent ever triggered a memory for you that reminded you of a happy time and instantly changed your mood? This happened to me the other day when I was grocery shopping. I simply walked past someone in an aisle who was wearing Jergens lotion—the lotion my grandmother wore after doing the dishes (it always sat in her window sill above the sink)—and I immediately breathed it in deeply, closed my eyes, and smiled. My entire grocery trip was flooded with thoughts of my grandmother from as much as 25 years ago (she died when I was 16) and my mood and heart felt at peace. That's all I'm talking about...the fact that God made our brains to respond to smell. The cells in your nose that smell are linked to your limbic system, which, you guessed it, governs emotions. All I'm saying is that God knew what He was doing when He created us. Our bodies are intricately woven together in a cause and effect cycle that is absolutely breathtaking! Truly, we are fearfully and wonderfully made (Psalm 139:14)! 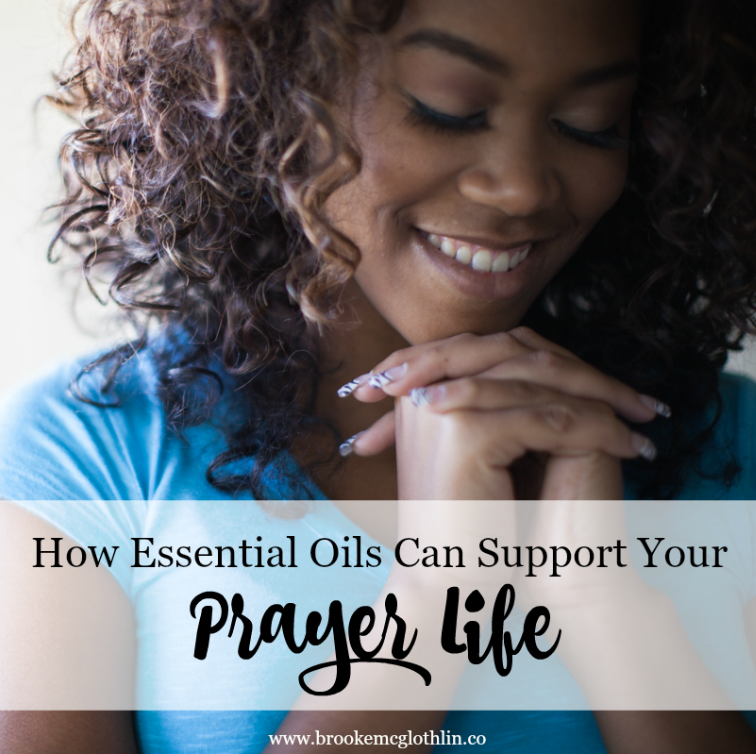 So how DO essential oils support prayer? Go with me for a minute back to your Intro Psyc class freshman year where you learned about Pavlov's dog. (No, I'm not suggesting we're all dogs, or monkeys, or anything other than God's grand design, but I do believe this theory illustrates something about us that we can all relate to). Ivan Pavlov was a Russian physiologist who realized that dogs salivated when he brought food into the room. Eventually, he made the discovery that his dogs salivated in anticipation of food even when he didn't have food with him. Over time, the dogs learned to associate certain things (lab assistants, bells, etc) with food, and would drool at just the sight (or sound) of them. We are the same way. Right this moment, I'm thinking about a big, fresh loaf of bread. I haven't had a big, fresh, loaf of bread in over three years, but I love bread. Just thinking about bread makes my mouth water with anticipation. SMELLING the bread baking is a temptation I often can't resist (which is why I don't bake it anymore). I'm not saying we're dogs, but this "classical conditioning," as Pavlov called it, is a real thing, and it can work in our favor to enhance our prayer lives. Choose a "sacred space" to hold your prayer time each day. I like to sit in my "green prayer chair" every morning. Same chair, same view of the mountains and creek in front of my home. Create an environment you look forward to. Make sure you're comfortable (but not too comfortable! Don't want to fall asleep! ), and have your supplies (Bible, pens, your copy of the Book of Prayer, etc) close by. Choose an essential oil (or combination of oils—I like Balance and Wild Orange) whose scent you enjoy. For example, my son loves Wild Orange. I let him smell it the other day and he said, "I could literally stand here and smell this all day. This is a happy oil!" If there's an oil that produces that reaction in you, that's the one! Every day, when you sit down to pray, turn on your diffuser with your "Happy Oil" combo in it. Over time, as you meet with God regularly, your brain will begin to associate that smell with how spending time with God makes you feel (hopefully good, peaceful, and at rest!). Then you can start using that smell to help prepare your heart and mind to enter into worship of and conversation with the King of kings and Lord of lords. The scent triggers the correct response. Actually, they work together in a beautiful, cyclical relationship where the scent triggers the response, and the response enhances the feelings associated with the scent. To learn more about how essential oils can work to help support the way God made our bodies, consider joining me for one of my monthly essential oil studies! Click here to see if you're a good fit!